The Scoop: When a business decides to give money to a cause, knowing where its donation will make the most impact is a good place to start. Charity Navigator rates charities and organizations not only on their financial data and how much money they use to directly impact their cause, but also on their transparency and accountability. Dating sites, apps, and other related companies can research and vet organizations on Charity Navigator to make sure their money is making the biggest impact. It can help out in the workplace, too, as studies have shown that companies with a charitable culture are more engaging to employees and more desirable to recruits. In 2009, Red, a pit bull terrier, saw his life change dramatically in a flash. When an intruder attacked his owner in their Chicago home, Red jumped to his owner’s defense. Red’s owner sustained injuries during the robbery, but Red was shot in the back while trying to protect him. As his owner was rushed off to the hospital, Red was transported to the city pound. After workers saw the extent of Red’s injuries, euthanasia seemed like the only option — until he was spotted by a member of Pets Are Worth Saving (PAWS) Chicago. Red’s back legs and tail were paralyzed in the shooting, and PAWS Chicago provided the extensive medical care he needed to ensure a good quality of life. When his owner was unable to take him back after the attack, PAWS Chicago also found Red a loving new home. Organizations like PAWS Chicago rely heavily on donations to help animals like Red, and while appealing to donors can take plenty of work, fundraising can often come down to one major factor: reputation. That is where Charity Navigator, an independent watchdog that rates the impact and transparency of charities, can help a cause attract donors — or even a corporate partnership. Charity Navigator evaluates organizations like PAWS Chicago, which helped Red, right, recover and find a new forever home. PAWS Chicago is one of only a handful of charities that have earned a perfect rating from Charity Navigator, meaning it has an impeccable track record of success in helping animals. When dating-related corporations are looking for charities or nonprofits to partner with or donate to, they want to make sure money is going to a worthy, reputable organization, and Charity Navigator does the legwork to make those decisions easier. When a company wants to give back, selecting a reputable charity is the first step in the process. Because every charity is not created equal, some can make a larger impact per donation dollar because of structure, size, or even their organization’s mission. Many Charity Navigator users also visit the site to research a particular organization. 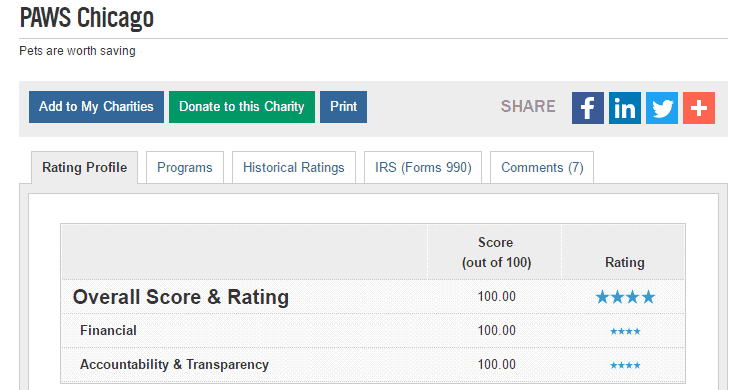 Charity Navigator provides that information by securing financial documents, scouring websites, and inspecting donor privacy policies before rating an organization on a one- to four-star scale. The overall rating is calculated by evaluating three areas: financial data, accountability, and transparency. PAWS Chicago earned a perfect rating from Charity Navigator and will continue to work to maintain it. Metrics within each of those categories provide a clear picture of the impact a charity makes and how forthcoming it is with information. On the financial side, the program expenses metric is one of the most important, as it shows the percentage of a charity’s total expenses it uses on the services it delivers. The higher the percentage a charity spends in this area, the more real impact it makes. The site provides updated Top 10 lists of charities — such as most popular, most followed, and worth watching — so donors can learn more about both established and rising organizations. Charity Navigator also posts advisories when there is suspicion of fraud or any other sign that a cause might need more scrutiny before giving a donation. 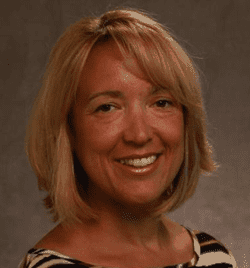 “Top 10 lists are one of the most popular pieces of content on our site because there are more than a million charities in America, so providing a list of the best in certain categories introduces givers to more causes,” Sandra said. Through in-depth analysis, Charity Navigator breaks down the strengths — and weaknesses — of organizations, making giving decisions easier and helping to spark more genuine business-charity connections. When businesses and charities work together, the impact can be great for both communities and causes — if the partnership is created for the right reasons. Cause marketing, the practice of a business and charity joining forces for mutual benefit, has been popular with retailers, but can also draw the scrutiny of consumers. There are many examples of cause marketing that doesn’t hit the right note with consumers, like selling Slurpees or buckets of chicken to fight cancer. While cause marketing can sometimes fall flat — or worse, result in a backlash — a partnership based on giving can resonate more. “We are starting to see corporations bake the idea of giving into their company from the outset,” Sandra said. And when companies integrate giving into their fabric and culture, they can also see the benefit of a more confident, engaged workforce. While cause marketing is mutually beneficial for each entity’s bottom line, creating a culture of giving can have a far bigger impact on a company. Studies have shown that corporate philanthropy boosts employee productivity and millennials are more likely to want to work at a company that gives back. Sandra Miniutti told us about Charity Navigator’s impact. Weaving this giving into a company culture can take many forms, including the business matching gifts given by employees or offering group volunteer hours in addition to donations. Charity Navigator’s role in the process is to identify worthy causes whose missions align with that of a business. With transparency and trust as the foundation of a company-charity partnership, businesses can create a long-term plan for investing in a cause. Red’s story is an excellent example of what is at stake when a gift is made to a charity. Without a network of committed donors — and its reputation as a model charity — PAWS Chicago wouldn’t have had the resources to help him or many of the other animals in need. Charity Navigator shines a light on charities like PAWS Chicago so the world can see their impact, and donors can contribute to their causes with confidence in the difference they are making. When donors trust they are making an impact, they are more likely to give continually. That giving leads directly to helping people, pets, the environment, or whatever noble cause a charity champions. Charity Navigator plays an important role in making sure the most reliable and respectable organizations are recognized and rewarded for their efforts.